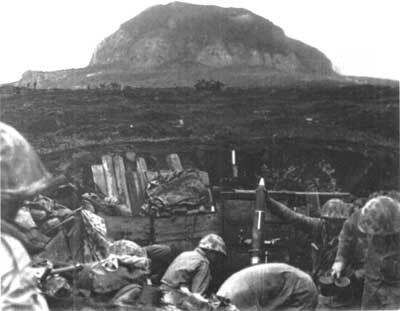 The Japanese called the dormant volcano Suribachi-yama; the Marines dubbed it "Hotrocks." From the start the Marines knew their drive north would never succeed without first seizing that hulking rock dominating the southern plain. "Suribachi seemed to take on a life of its own, to be watching these men, looming over them," recalled one observer, adding "the mountain represented to these Marines a thing more evil than the Japanese." Colonel Kanehiko Atsuchi commanded the 2,000 soldiers and sailors of the Suribachi garrison. The Japanese had honeycombed the mountain with gun positions, machine-gun nests, observation sites, and tunnels, but Atsuchi had lost many of his large-caliber guns in the direct naval bombardment of the preceding three days. General Kuribayashi considered Atsuchi's command to be semiautonomous, realizing the invaders would soon cut communications across the island's narrow southern tip. Kuribayashi nevertheless hoped Suribachi could hold out for 10 days, maybe two weeks. 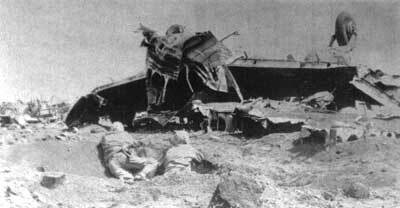 Some of Suribachi's stoutest defenses existed down low, around the rubble-strewn base. Here nearly 70 camouflaged concrete blockhouses protected the approaches to the mountain; another 50 bulged from the slopes within the first hundred feet of elevation. Then came the caves, the first of hundreds the Marines would face on Iwo Jima. The 28th Marines had suffered nearly 400 casualties in cutting across the neck of the island on D-day. On D+1, in a cold rain, they prepared to assault the mountain. Lieutenant Colonel Chandler Johnson, commanding the 2d Battalion, 28th Marines, set the tone for the morning as he deployed his tired troops forward: "It's going to be a hell of a day in a hell of a place to fight the damned war!" 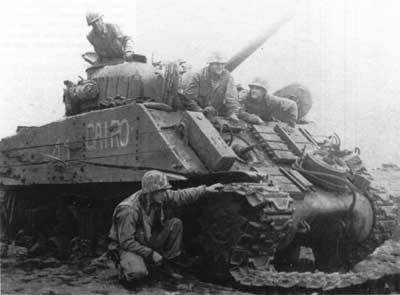 Some of the 105mm batteries of the 13th Marines opened up in support, firing directly overhead. Gun crews fired from positions hastily dug in the black sand directly next to the 28th Marines command post. Regimental Executive Officer Lieutenant Colonel Robert H. Williams watched the cannoneers fire at Suribachi "eight hundred yards away over open sights." As the Marines would learn during their drive north, even 105mm howitzers would hardly shiver the concrete pillboxes of the enemy. As the prep fire lifted, the infantry leapt forward, only to run immediately into very heavy machine-gun and mortar fire. Colonel Harry B. "Harry the Horse" Liversedge bellowed for his tanks. But the 5th Tank Battalion was already having a frustrating morning. The tankers sought a defilade spot in which to rearm and refuel for the day's assault. Such a lo cation did not exist on Iwo Jima those first days. Every time the tanks congregated to service their vehicles they were hit hard by Japanese mortar and artillery fire from virtually the entire island. Getting sufficient vehicles serviced to join the assault took most of the morning. Hereafter the tankers would maintain and reequip their vehicles at night. This day's slow start led to more setbacks for the tankers; Japanese antitank gunners hiding in the jumbled boulders knocked out the first approaching Shermans. Assault momentum slowed further. The 28th Marines overran 40 strongpoints and gained roughly 200 yards all day. They lost a Marine for every yard gained. The tankers unknowingly redeemed themselves when one of their final 75mm rounds caught Colonel Atsuchi as he peered out of a cave entrance, killing him instantly. The wreckage was indescribable. For two miles the debris was so thick that there were only a few places where landing craft could still get in. The wrecked hulls of scores of landing boats testified to one price we had to pay to put our troops ashore. Tanks and half-tracks lay crippled where they had bogged down in the coarse sand. Amphibian tractors, victims of mines and well-aimed shells, lay flopped on their backs. Cranes, brought ashore to unload cargo, tilted at insane angles, and bulldozers were smashed in their own roadways. Bad weather set in, further compounding the problems of general unloading. Strong winds whipped sea swells into a nasty chop; the surf turned uglier. These were the conditions faced by Lieutenant Colonel Carl A. Youngdale in trying to land the 105mm-howitzer batteries of his 4th Battalion, 14th Marines. All 12 of these guns were preloaded in DUKWs, one to a vehicle. Added to the amphibious trucks' problems of marginal seaworthiness with that payload was contaminated fuel. As Youngdale watched in horror, eight DUKWs suffered engine failures, swamped, and sank with great loss of life. Two more DUKWs broached in the surf zone, spilling their invaluable guns into deep water. At length Youngdale managed to get his remaining two guns ashore and into firing position. General Schmidt also committed one battery of 155mm howitzers of the corps artillery to the narrow beachhead on D+1. Somehow these weapons managed to reach the beach intact, but it then took hours to get tractors to drag the heavy guns up over the terraces. These, too, commenced firing before dark, their deep bark a welcome sound to the infantry. Concern with the heavy casualties in the first 24 hours led Schmidt to commit the 21st Marines from corps reserve. The seas proved to be too rough. The troops had harrowing experiences trying to debark down cargo nets into the small boats bobbing violently alongside the transports; several fell into the water. The boating process took hours. Once afloat, the troops circled endlessly in their small Higgins boats, waiting for the call to land. Wiser heads prevailed. After six hours of awful seasickness, the 21st Marines returned to its ships for the night. Even the larger landing craft, the LCTs and LSMs, had great difficulty beaching. Sea anchors needed to maintain the craft perpendicular to the breakers rarely held fast in the steep, soft bottom. "Dropping those stern anchors was like dropping a spoon in a bowl of mush," said Admiral Hill. Hill contributed significantly to the development of amphibious expertise in the Pacific War. For Iwo Jima, he and his staff developed armored bulldozers to land in the assault waves. They also experimented with hinged Marston matting, used for expeditionary airfields, as a temporary roadway to get wheeled vehicles over soft sand. On the beach at Iwo, the bulldozers proved to be worth their weights in gold. The Marston matting was only partially successfulLVTs kept chewing it up in passagebut all hands could see its potential. Admiral Hill also worked with the Naval Construction Battalion (NCB) personnel, Seabees, as they were called, in the attempt to bring supply-laden causeways and pontoon barges ashore. Again the surf prevailed, broaching the craft, spilling the cargo. In desperation, Hill's beach masters turned to round-the-clock use of DUKWs and LVTs to keep combat cargo flowing. Once the DUKWs got free of the crippling load of 105mm howitzers they did fine. LVTs were probably better, because they could cross the soft beach without assistance and conduct resupply or medevac missions directly along the front lines. Both vehicles suffered from inexperienced LST crews in the transport area who too often would not lower their bow ramps to accommodate LVTs or DUKWs approaching after dark. In too many cases, vehicles loaded with wounded Marines thus rejected became lost in the darkness, ran out of gas and sank. 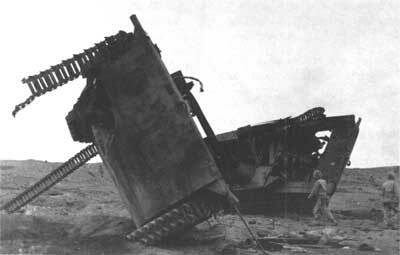 The amphibian tractor battalions lost 148 LVTs at Iwo Jima. Unlike Tarawa, Japanese gun fire and mines accounted for less than 20 percent of this total. Thirty-four LVTs fell victim to Iwo's crushing surf; 88 sank in deep water, mostly at night. Once ashore and clear of the loose sand along the beaches, the tanks, half-tracks, and armored bulldozers of the landing force ran into the strongest minefield defenses yet encountered in the Pacific War. Under General Kuribayashi's direction, Japanese engineers had planted irregular rows of antitank mines and the now-familiar horned antiboat mines along all possible exits from both beaches. The Japanese supplemented these weapons by rigging enormous makeshift explosives from 500-pound aerial bombs, depth charges, and torpedo heads, each triggered by an accompanying pressure mine. Worse, Iwo's loose soil retained enough metallic characteristics to render the standard mine detectors unreliable. The Marines were reduced to using their own engineers on their hands and knees out in front of the tanks, probing for mines with bayonets and wooden sticks. While the 28th Marines fought to encircle Suribachi and the beach masters and shore party attempted to clear the wreckage from the beaches, the remaining assault units of the VAC resumed their collective assault against Airfield No. 1. In the 5th Marine Division's zone, the relatively fresh troops of the 1st Battalion, 26th Marines, and the 3d Battalion, 27th Marines, quickly became bloodied in forcing their way across the western runways, taking heavy casualties from time-fuzed air bursts fired by Japanese dual-purpose antiaircraft guns zeroed along the exposed ground. In the adjacent 4th Division zone, the 23d Marines completed the capture of the airstrip, advancing 800 yards but sustaining high losses. There was no cover from enemy fire. Japs dug in reinforced concrete pillboxes laid down interlocking bands of fire that cut whole companies to ribbons. Camouflage hid all enemy positions. The high ground on either side was honeycombed with layer after layer of Jap emplacements . . . . Their observation was perfect; whenever a Marine made a move, the Japs would smother the area in a murderous blanket of fire. The second day of the battle had proven unsatisfactory on virtually every front. 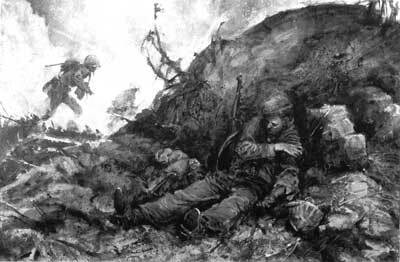 To cap off the frustration, when the 1st Battalion, 24th Marines, finally managed a break through along the cliffs late in the day their only reward was two back to-back cases of "friendly fire." An American air strike inflicted 11 casualties; misguided salvos from an unidentified gunfire support ship took down 90 more. Nothing seemed to be going right.